SCVHistory.com LW2957 | Film-Arts | Joel McCrea Stars in Owen Wister's 'The Virginian' (Paramount 1946). Joel McCrea, Brian Donlevy and Sonny Tufts star in Paramount's 1946 feature film adaptation of Owen Wister's "The Virginian." We don't know where this 8x10 publicity still was shot. It would make sense for it to be the Jauregui Ranch, because Jauregui was a big-time livestock provider. But he could have provided stock anywhere. We're unaware of Hickson owning locomotives, and no locomotive was listed among the inventory when his ranch was sold to Gene Autry in 1953 (Schneider 2011:474-475). It could the twin of Autry's 2-8-2 Engine No. 463, but that's just coincidence. 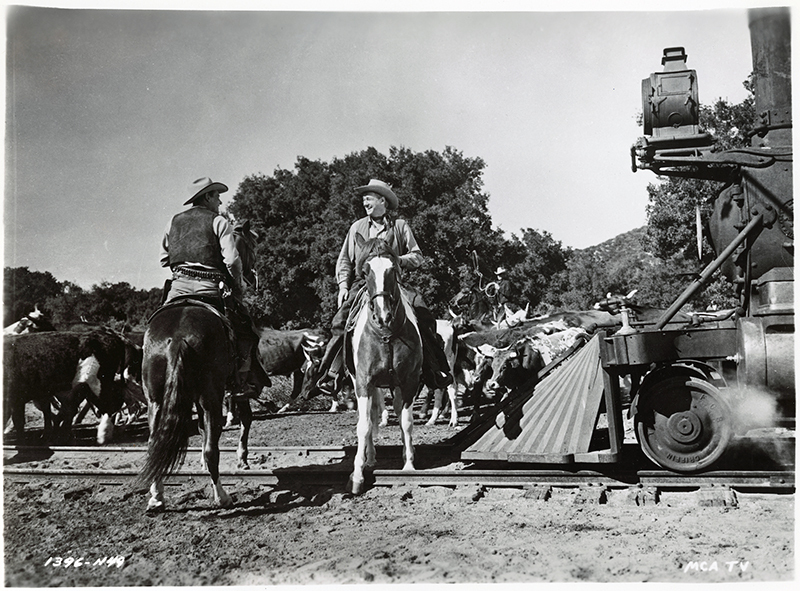 Autry wasn't in the equation in 1946, and it wasn't until 1955 that he bought the locomotive. 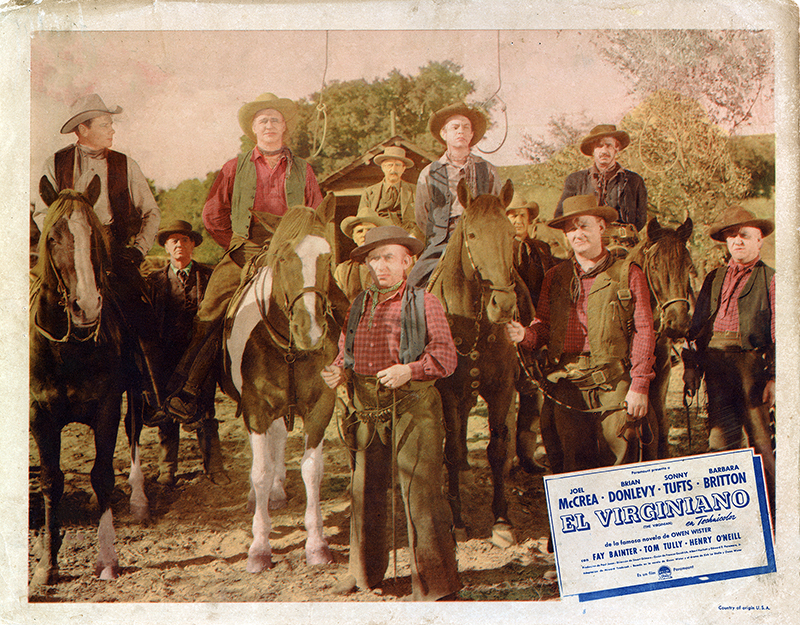 The television version of "The Virginian" (9 seasons, 1962-1971) didn't use Melody Ranch, probably because its Western street burned down in August 1962. Rounding out the credited cast of the 1946 film are Barbara Britton, Fay Bainter, Tom Tully, Henry O'Neill, Bill Edwards, William Frawley, Paul Guilfoyle, Marc Lawrence and Vince Barnett. LW2957: 9600 dpi jpeg from original photograph purchased 2017 by Leon Worden.